Dental crowns are a reliable and commonly used restoration for teeth that have been damaged or have weakened over time. Crowns are extremely versatile and at Northway Dental Practice we also use them to support dental bridges to stay in place and to replace large fillings on teeth that have been affected by decay. Dental crowns can be built from a variety of materials, but the most popular option with our patients are crowns built from ceramic. These not only look and feel like a natural tooth, they completely blend into the mouth and are barely noticeable. 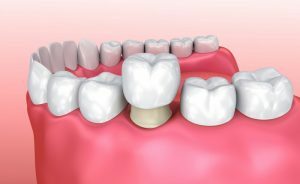 What is the crown treatment process? If you require a crown, your dentist will go through the different stages with you prior to treatment. They will also take impressions of your teeth so that our laboratory can build you a bespoke crown. Prior to the crown being affixed to your tooth, we will first need to repair and rebuild the damaged tooth. Once this has been done, the crown will be adhered to the remaining section of your tooth. Treatment will be carried out under local anaesthetic, ensuring your comfort throughout.